Two independent elementary schools in Richmond—the Az-Zahraa Islamic Academy and the Richmond Jewish Day School— bridge multiple barriers for a joint project every year. 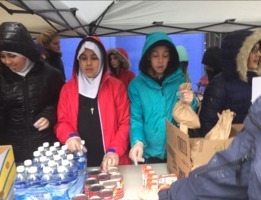 First, they bring together Grade 6 and 7 students from the Jewish and Muslim faiths. Second, they take these students to the Downtown Eastside, exposing them to residents in Canada’s poorest postal code, where homelessness, violence and drug addiction are common. Richmond RCMP accompany the students to the city and then Vancouver Police take over guardianship. Teachers were grateful for that extra protection this year when an armed man was hauled out of a car and arrested right in front of the students. And, at the end of the day, a debrief session, involving all participants from both schools, teachers, the RCMP and copious amounts of pizza — both halal and kosher — helped the students put their recent experience into context. “Each time we get together, there’s something we learn,” says Sukaina. In previous years, the schools had been able to distribute lunches thanks to support from Save-On-Foods. Lacking that sponsorship this year, they had to restrict themselves to juice-boxes, cheese-snacks and granola bars. But there’s no question the program will go ahead next year.